112 Eatery. It hugs the edge of the Warehouse District on 3rd Avenue just before downtown disgorges its traffic onto 94 and points north. Tonight is our 35th anniversary ( April 4, 2016) and 112 is an obvious choice. Its Monday night. For the past decade we have been seated on the main floor. An oak bar lines half of one wall with a thin row of tables leading to the back. On the other side a row of booths, wood paneling, and a long wood framed mirror give way to a bare brick wall. 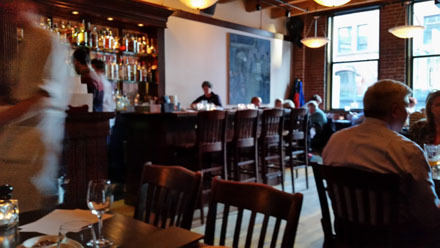 There are a handful of tables in the front lining a large window facing the street that provides views of Chicago Commercial style buildings from the turn of the last century. Owner and Chef Isaac Becker’s coveted James Beard Award occupies the center of the window underneath the restaurant’s name. Tonight, after 10 years we learn there is an upstairs dining room. The upstairs follows the theme of the main floor with a bar on one side and a row of tables along the front and the wall opposite the bar. Here large 4’ x 5’ abstract paintings hang on the bare red brick walls absorbing sound. Despite the full house composed of attorneys, financial types and tony young professionals, the paintings do their job, allowing conversation without yelling. Massive antique blond 6” x 2’ bare wood beams support the ceiling. 112 offers 12 bottled or canned beers. I order s Surly and Nancy orders a Jamesons. We have been here at least a dozen times and most of the time we just load up on appetizers. This time I vow to order at least one entrée. We start with the 112 Steak Tartare ($15) – about a cup of minced steak, raw egg, onions and capers with a generous serving of toasted baguette. Although scaled down slightly in size from past visits, this is still the best in the state and we order it every time. Normally we follow the tartare with the foie gras/lardon salad ($18) but tonight we get the sticky sweetbreads with cheddar grits ($14). These are a perfect example of why one should eat sweetbreads. We take 20 minutes or more savoring the three tender sweetbreads with a sweet glaze. We finish up with a romaine salad dressed with Roquefort ($8) and foie gras stuffed quail with a parsnip puree and maple glaze ($24). The quail looks half again as large as the birds that visit my bird feeder but the foie gras stuffed into the breast makes it a meal. The entire meal is one of the best we have had in a long time but the star is Nancy Silverton’s butterscotch budino. We are looking forward to returning to celebrate our next life milestone.